Tuesday, Mar. 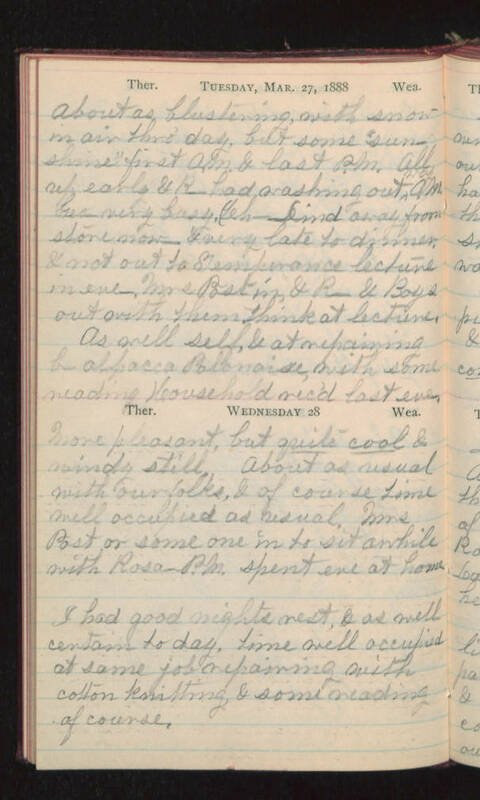 17, 1888 About as blustering with snow in air thro' day, but some "sunshine" first A.M. & last P.M. All up early & R- had washing out way A.M. Geo very busy, (Leh- (?) away from store now - & very late to dinner, & not out to Temperance lecture in eve -, Mrs Post in & R- & Boys out with them, think at lecture. As well self, & at repairing b alpaca polonaise, with some reading Household rec'd last eve. Wednesday 28 More pleasant, but quite cool & windy still. About as usual with our folks, & of course time well occupied as usual. Mrs Post or some one in to sit awhile with Rosa P.M. spend eve at home. I had good nights rest, & as well certain today, time well occupied at same job repairing with cotton knitting, & some reading of course.